It was so good to be back. 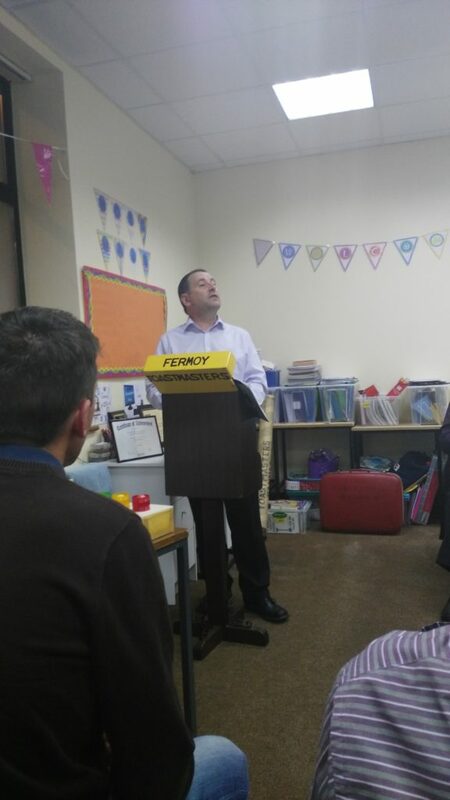 That was the universal feeling of the members and friends of Fermoy Toastmasters Club as we gathered at the commencement of our new season of meetings on the evening of Tuesday, September 11th, at the Fermoy Youth Centre. The top table very pleased that the first meeting of the season has gone off so well. From right:- Johanna Hegarty, who gave us such a lively and entertaining topics session; Eilish Ui Bhrian reprising her role as Club President and doing so with such charm, grace and warmth; Jerry Hennessy, Toastmaster, who always brings such an affable and pleasant lightness of touch to his participation in our club which is so enhanced by his active support and friendship to us all. The room quickly filled with one of the largest attendances ever seen at a first night after the long summer break. It was such a pleasure to greet so many dear friends and also to welcome both new guests to our club for the first time and to see a number of familiar faces so delightfully back with us again after some while. It lifts the spirit to hear the buzz of friendly chatter as warm handshakes are exchanged and cordial sentiments are spoken. Our Club President for this year, Eilish Ui Bhriain called proceedings to order with a very amiable and genial welcome that set a relaxed and pleasant tone for the evening ahead. Having served in this office previously with great distinction and accomplishment, we look forward to another very successful and enjoyable year with the warmth, grace and kindness of her leadership. David Walsh enjoying the first meeting of the new season September 11th 2018. David usually takes many of the pictures featured here but every once in a while he makes a very welcome appearance in front of the lens. Doesn’t he look well! The President presides but it is the Toastmaster or chairperson of the evening who introduces the speakers and guides proceedings forward smoothly and seamlessly. In this role Jerry Hennessy turned in an outstanding performance with his always winning lightness of touch and ready humour as in reminding the audience to turn their mobile phones back on after the meeting had concluded, for the whole purpose of our gathering is to live well, laugh a lot and to be happy. And it was in that optimistic and effervescent spirit that Johanna Hegarty provided us with two highly entertaining and very stimulating topics sessions. The essence of Toastmasters is participation, that is its challenge but also its strength tapping into the talents, idealism and creative energies that we all have. In topics one person is asked to speak impromptu on a chosen subject without prior notification for no more than two minutes. One minute add-ons from other speakers then follow. This gets everyone thinking quickly and actively involved, for one contribution will usually spur someone else to join in with a perspective of their own taking in a rich, colourful, witty and stimulating variety of views and ideas all so very fresh and original. It is a very bracing and most effective mental exercise broadening our individual horizons and what is good for the mind is most conducive to overall physical health and well-being. The travails of the Irish soccer team, the brilliance of the Cork camogie players, the current trends in popular music, the race for the Presidency and the question of how Donald Trump should be received in Ireland even as the news was just beginning to filter through that the American Presidential tour had been put off, these and so very much more in the two topics sessions on either side of the mid-way tea/ coffee break with scones and cream brought to us by the kindness of our dear friend Helsa Giles from Mallow, made for a brilliant and most entertaining meeting. 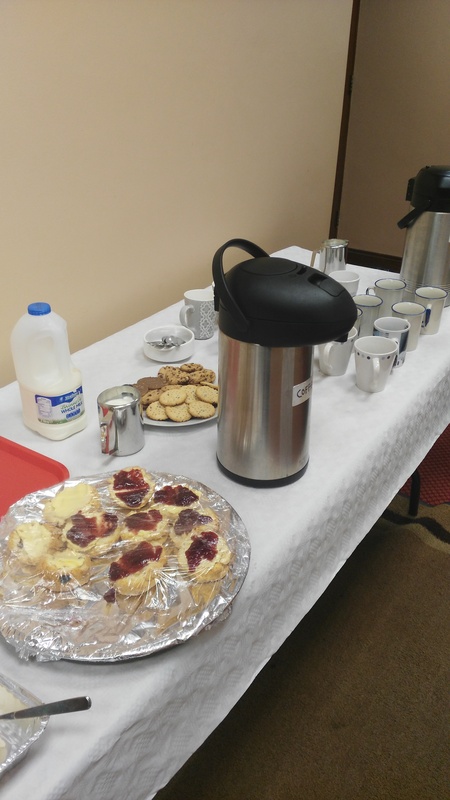 All ready for tea and coffee with delicious scones from Helsa Giles for the mid-meeting break which is such a special time for relaxed chat and warm genial interaction. This sets the stage perfectly for the prepared speeches which form the core of every meeting. Speakers do not read from a text but use notes as prompts and reminders when necessary, the ultimate ideal being to speak with confidence and proficiency without use of any notes at all. Our first speech was from one of our most dedicated and committed members, Michael Sheehan, who shared his interest in all things historical and archaeological as he took us on an epic journey through the centuries around Listowel Castle in Co. Kerry, charting its course of ages through times of power and prestige as the seat of the great Anglo-Norman Fitzmaurice family and through darker days of war and siege. By the mid- 18th century the castle was abandoned and fell into utter ruin and dereliction, reclaimed by nature in the grip of wind, weather and ivy. But then just as all seemed lost it was to undergo an amazing renewal: acquired by the State, the castle underwent extensive restoration and since 2005 has been open to the public with guided tours as a deservedly popular attraction. A fascinating story so well told by Michael in such a very well-researched, richly evocative and outstanding presentation. 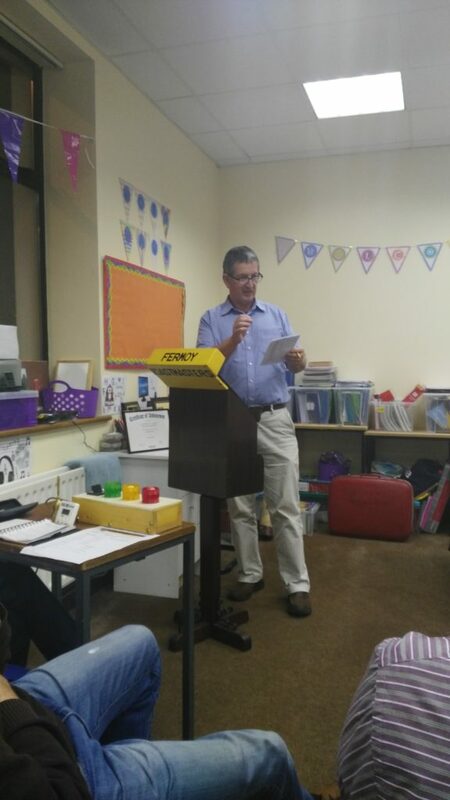 Kevin Walsh delivering his speech at the September 11th meeting, the first of the Autumn 2018 season. 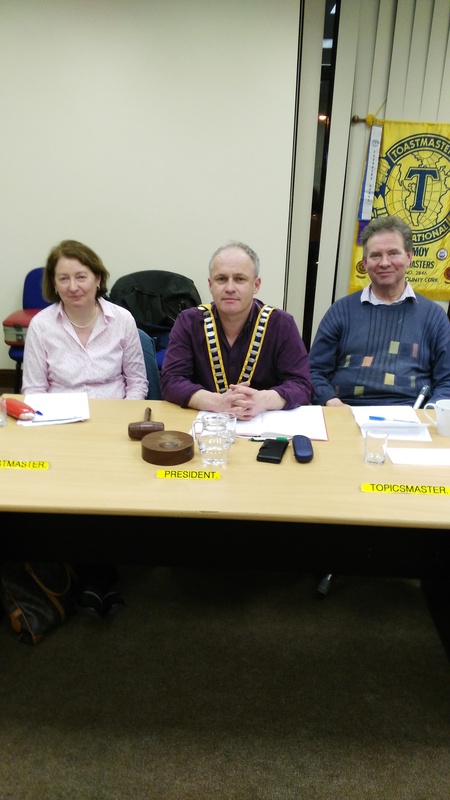 Also pictured (from left):- Jerry Hennessy, Toastmaster of the evening; Club President Eilish Ui Bhriain; Johanna Hegarty, Topicsmaster. Kevin Walsh then took us on a threefold journey through the theme of love, illustrated by the story of a man he once met who fondly remembered the excitement and joy of his first romance many years ago. But love’s young dream had failed to bear fruit and they had sadly parted. Four decades later that man found himself alone and unloved and his thoughts wandered back to his first sweetheart. Against all odds contact was re-established and both discovered they were now free to enjoy a mellow and delightful friendship. Then he went on to describe a visit to Kilmainham Gaol during the past summer and being most impressed by the execution yard where Pearse, Connolly and the other 1916 leaders had made the supreme sacrifice for their fervent love of their country, a love that had not failed for above the place of their martyrdom now proudly flies the flag of the free and independent nation to which we belong today. Finally, Kevin shared some memories of the recent wedding in Cork of that outstanding Toastmaster and dear friend Brian O’Farrell with the lovely Michelle Murphy, a day of sunshine, celebration and happiness, summed up in the words of Brian’s brother Sean who as best man said of Brian that ‘he has a heart as big as the ocean’. The essence of love is boundless generosity of spirit. Kevin said that love is the only thing that heals and elevates our lives in this broken world and concluded with the famous quote of St. Paul that we should all make love our aim. Fanahan Colbert presents his verdict on John Sherlock’s speech full of very practical, sensible and wise advice on the best time and best way of buying a new car. Words spoken in this room of friendship and good cheer travel ever further along the highways of happy memory from which we all take so much that is positive, thoughtful and illuminating. John Sherlock then took us on a very different journey with a very practical, well-crafted talk full of sound and sensible advice on the buying of cars, cautioning against purchase at the beginning of January when demand is highest but citing the end of June as a good time to make that deal when garages pre-register many of their unsold models. John advised it is now better to think of petrol rather than diesel and that hybrid is a far better option than purely electric cars which have only very limited range. All of the financial options were carefully examined, beginning with PCP higher purchase arrangements which are quite manageable even if the vehicle is never fully yours, but representing a considerably lighter interest repayment burden as compared to bank and credit union loans. He went on to say laughingly that of course the best thing to do might be to invest your communion and confirmation money in a new car! This excellent speech was such a pleasure to listen to and was delivered so stylishly by a true master of the art. Frank O’Driscoll at the lectern making his very fine and insightful evaluation of Kevin Walsh’s speech. Nothing in Toastmasters ever stands alone: everything is part of a much bigger picture. To every speaker there is an evaluator giving positive feedback, praising the speaker’s achievements and pointing the way to ever further improvement as was so well done by Tim Fitzgerald, Fanahan Colbert and Frank O’Driscoll. Then there is a final overall assessment and impression of the meeting on this occasion from David Walsh who expressed the gladness of us all at the success of this first night back and particularly focused in on the precision and diligence of Mary Whelan in her vital role as Timekeeper working the stopwatch and lights that regulate each phase of the meeting. One of our most well-loved members Mairead Barry said a lovely few words of thanks for the floral bouquet she had received from the Club during her recovery from surgery some months ago. Some of the attendance enjoying a very successful evening on September 11th 2018 and eager for the new season ahead. At the end of one meeting there is a looking forward to the next which will take place at the Fermoy Youth Centre on this coming Tuesday evening next, September 25th, at 8.15 pm. We joyfully look forward to seeing you all then. For further information, please contact Mary Whelan at 087 7971006 or Kevin Walsh at 058 60100 or log on to our mobile-friendly website toastmastersfermoy.com or find us on Twitter @ FermoyT. Club President Eilish Ui Bhriain with the chain of office she was presented following her election at the club AGM on May 8th 2018, together with the Officers Committee for the coming season 2018-19. To right of picture is Vice-President for Membership Mary Whelan and Club Treasurer Johanna Hegarty, left. 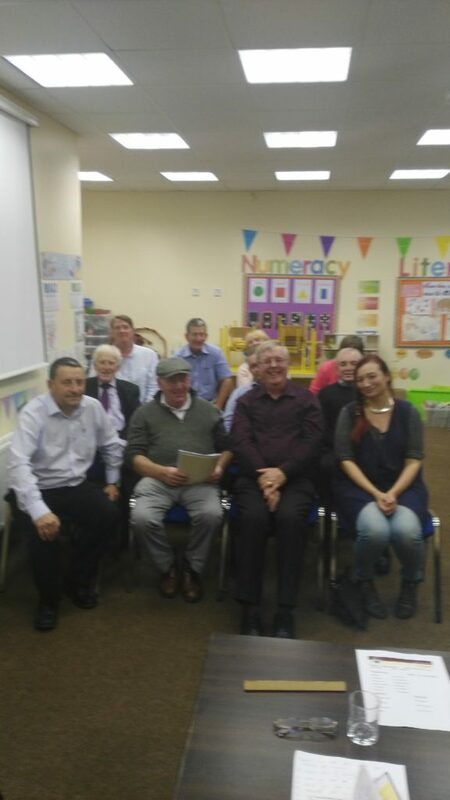 Back row, starting from right is Tim Fitzgerald, Sergeant-at-Arms; Padraig Murphy, Educational Vice-President or Meeting Organiser; Jerry Hennessy, Secretary and Kevin Walsh, PRO. Last year’s President Kevin O’Neill (not pictured) stays as committee member ex officio. We are all delighted to welcome the return of Eilish to the presidential role which she previously carried through with such success and distinction with all of her warmth, kindness and charm. The Committee is marked by great talent and enthusiasm, dedication and commitment to the goals and ideals of Toastmasters in mutual friendship and goodwill and we look forward to a great and very promising year ahead. 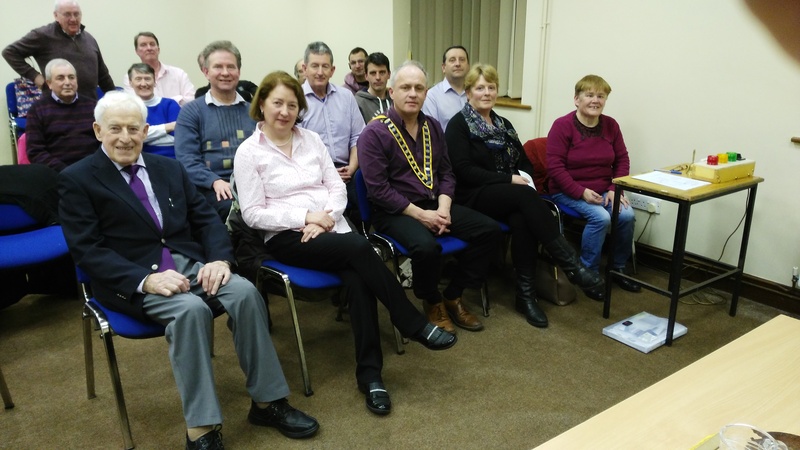 On the evening of Tuesday, May 8th, Fermoy Toastmasters gathered for the final meeting of the current season in the pleasant and relaxing riparian setting of the local Youth Centre. How swiftly time has passed since we commenced last autumn and maintained a brilliant and most enjoyable series of meetings all through the dark winter months, having to cancel only one because of the blizzard conditions in early March. And now the time for our Annual General Meeting had come round where the outgoing officers’ committee rendered an account of their stewardship over the previous year to be followed by the election of their successors to bring us forward into the next season. It is one of the purest forms of democracy in the world that has at its heart the principle of accountability to the entire membership to whom the club belongs in the warmest friendship and mutual generosity of spirit. Sincere sympathies and heartfelt condolences were expressed to our dear friend Jerry Hennessy on the recent passing of his brother Denis. Before the important business of the evening could be addressed and as there were no set speeches to be heard, proceedings were called to order by our Meeting Organiser John Sherlock who has worked so tirelessly and with such immense enthusiasm to put together varied and hugely rewarding programmes for all of our gatherings over these many months past. 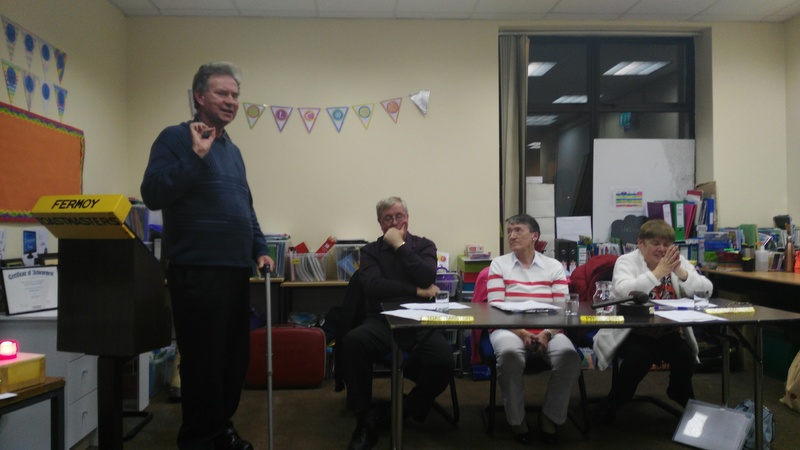 He then handed control of the meeting to Tim Fitzgerald who presented a highly original and engaging set of topical themes which evoked a wide and eager response. One of the most memorable posed the question of whether the job you had dreamed of doing in schooldays had come to reality in adult life. This drew a very thoughtful and illuminating response from one of our most admired and best loved personalities, John Kelly, which succinctly encapsulated almost his entire life story. He recalled how in his youth he had thought of becoming a motor mechanic, in that era before self-service filling stations he gave warm personal service and attention to motorists at the pumps for the essence of good business is genial personal interaction with the customer. He then went on to pursue the wave of the future assuming the challenge of television service before returning to the world of the motor trade with a brilliantly successful career as one of the best and most successful car salesmen in the country for more than three decades. A truly amazing record embracing the opportunities presented by ever changing times and always seeking to do one’s very best in every situation. Above all John emphasised the importance of being true to oneself and therefore always being true to others which leads on naturally and readily to a lasting fulfilment and happiness in what was such a very illuminating impromptu talk distilling the rich wisdom of a lifetime. The issue of the huge cervical smear test scandal was also addressed beginning with a thoughtful contribution from David Walsh deploring the lack of any sense of responsibility by those in high positions in our society, contrasting this with the noble example and character displayed by American President Harry Truman of many years ago who placed a sign on his desk in the Oval Office bearing the words: The Buck Stops Here. He argued that what we urgently need in Ireland today is an injection of that same spirit of responsibility by those who govern and administer us. This in turn drew from Johanna Hegarty a very compelling add-on recalling a decade ago the warnings conveyed from those working in pathology laboratory testing to the HSE and the Department of Health and Government that the outsourcing of cervical smears to an American facility where very different methods and standards applied would lead to serious difficulty further down the line. These warnings went unheeded and ignored. Today the cost of this bitter legacy of failure and suffering is having to be counted. Moreover once clear and simple management structures have congealed under bewildering layers of bureaucracy so that the buck is not so much passed as cannot even be found. Never was the need for the restoration of simplicity and directness more greatly and urgently felt. In these and so many other highly original and well-chosen topics, Tim gave us a thoroughly refreshing, thought-provoking and engaging interlude of spontaneous off-the-cuff speaking offered an outstanding finale to a truly great and highly successful season of great meetings and active participation. 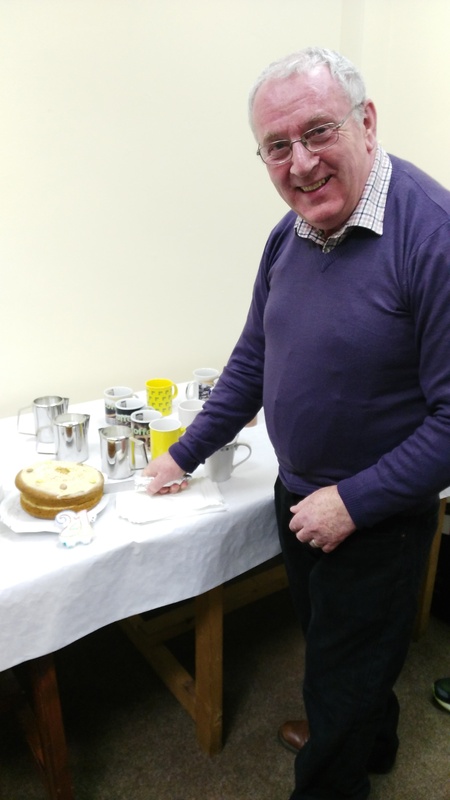 Outgoing EVP John Sherlock with an ever warm and genial smile cuts the cake so kindly brought to us by our new President Eilish Ui Bhriain during the tea/ coffee break at our Club Annual General Meeting in the Fermoy Youth Centre, May 8th 2018. 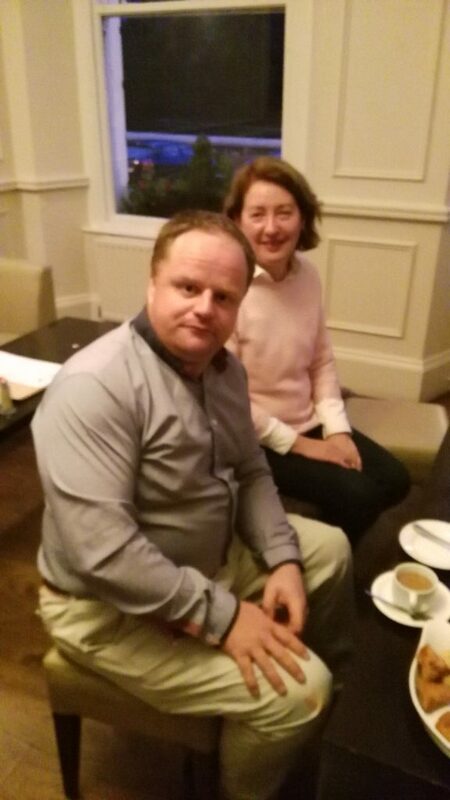 After a very convivial tea and coffee break richly enhanced by a delicious sweet cake baked specially by our dear friend Eilish Ui Bhriain, we then settled into the business of the AGM proper. Special thanks were expressed to our unavoidably absent President Kevin O’Neill for his distinguished service throughout the past year. Our Meetings Organiser John Sherlock praised the membership for their readiness to take part and to help in every way that made his task a very real and rewarding pleasure. Mary Whelan as Membership Secretary was delighted to place on the record of the meeting the overall expansion in the number of actively participating members throughout the year which augurs well for the future of our cherished club. Johanna Hegarty as Treasurer has done an outstanding job managing our finances which are in excellent shape and no increase in fees will be needed next year. Kevin Walsh as PRO said that his task was made so much easier and pleasant by the wonderful quality of the meetings he promotes and records. Then Fanahan Colbert came to take the chair and with skilful assuredness presided over the election of Club Officers for the coming year:- Eilish UI Bhriain makes a very welcome return as President; Padraig Murphy assumes the role of Meeting Organiser; Mary Whelan will with all of her dedication further the vital work of building and sustaining Membership; Jerry Hennessy returns to the Committee as Secretary; Johann Hegarty continues her sterling work as Treasurer; Tim Fitzgerald as Sgt-at-Arms is custodian of club property and ensures the meeting room is well arranged and prepared for every gathering; Kevin Walsh retains the post of PRO. To all of our newly elected officers we extend warmest best wishes for every success in the next season and throughout the coming year. Over the next two years together with clubs all across the world, we will all have to work together to learn, assimilate and utilise the new Pathways system with its emphasis on internet feedback and the resources of social media to promote and further the work of Toastmasters everywhere. It can seem daunting and does represent a major challenge. But again as John Kelly said, this merely represents the latest chapter in the never ending story of change in Toastmasters and life to which we must adapt while also seeking to influence and change. This is the heady optimism with which we will go forward to the future. And remembering the warmth, geniality and radiant goodwill of Eilish in her previous spell as President, we know she will make a strong and successful leader and the club will thrive under her wise and committed guidance and direction. Wishing to all a very happy and pleasant summer and we look forward to our next meeting on Tuesday, September 11th. For further information, please contact Mary Whelan at 087 7971006 or Kevin Walsh at 058 60100 or log on to our mobile-friendly website toastmastersfermoy.com or find us on Twitter @ FermoyT. Club President Kevin O’Neill welcomes everyone to the club meeting of April 24th 2018. To left of picture is Fanahan Colbert acting as Toastmaster or chairman of the evening’s proceedings with ease and assurance and Mary Whelan prepares to share her selection of topical and thoughtful themes for the off-the-cuff section of the meeting. Good topics sessions make for good meetings as we so happily enjoyed that evening. Speeches are not random or without purpose but rather fulfil a specific purpose as laid down in one of the communication assignment manuals such as that of using the right words to convey your meaning with clarity and understanding and avoiding all jargon which was the task taken on by Patricia Neilan in a very engaging and quicksilver speech on the ever relevant subject of motivation. Standing with assured confidence and ease at the lectern, Patricia recalled the long journey that brought her from her native Mexico to Ireland and in particular the huge linguistic leap from Spanish to English, opening the way to a new life here in Ireland with her husband Seoirse, a successful career in IT and active membership of Toastmasters. Indeed she told us of how joining our club was one of the best and most beneficial things that she has ever done. There are two types of motivation, she said: one based on an anxious wish to avoid failure in your chosen sphere of life, work and activity, and the other and far more positive and fulfilling one to improve and to build a better future, to enhance your capabilities and to advance on the road of achievement. Life is hard but we can all do something about making it better. Nothing worthwhile is ever achieved without patient and dedicated effort, but all the hard work in the world amounts to nothing if it not driven and sustained by that initial spark of enthusiasm, the motivation to reach out and seek to do something fulfilling and rewarding with your life. This was such an edifying and uplifting message that drew from evaluator Michael Sheehan a hearty Muchos Gracias – Many Thanks in Spanish which drew a very warm and full-hearted round of applause. 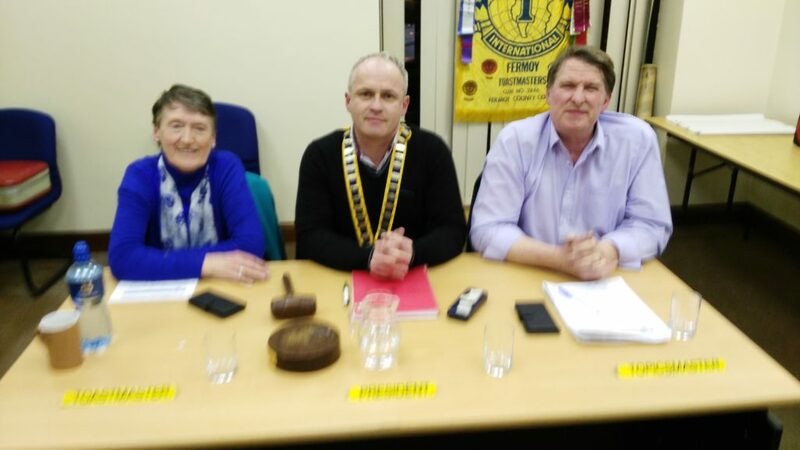 It is always such a pleasure to welcome a new member go to the lectern to deliver their maiden or Icebreaker speech, as we did that evening with Mark O’Brien of Fermoy but now resident in Kilworth. Father of his son Ollie and looking forward to getting married later in the year, Mark in a few short minutes gave us a lovely and most enjoyable overview of his life so far, a life that tells a powerful story of reinvention as he told of leaving school at sixteen to work in the construction industry. But after a few happy years thus engaged, he began to feel a sense of wanting to do more and find greater satisfaction. At twenty-one he returned for further education to CIT and acquired a degree in engineering which opened a whole new and exciting career for him, progressing further to gain a Masters in Pharmaceutical Engineering, engaged now in industry, a designer consultancy and has returned to CIT no longer as student but as lecturer. 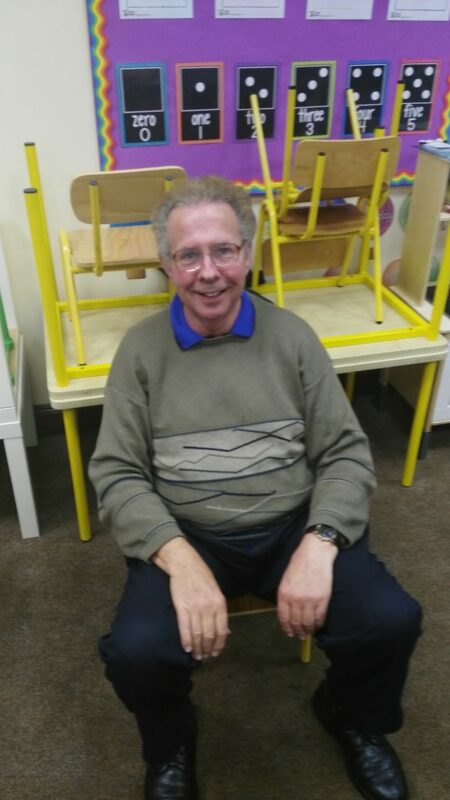 Following on Patricia’s theme of motivation, Mark has shown how it is possible for anyone to begin again and set off on a new path in life, receiving a very warm and welcoming evaluation later from John Kelly. We welcome Mark to our club and thank him for choosing us and wish him well on his new journey of personal growth and enjoyment. We look forward to enjoying the richness of his contribution and above all the pleasure of his friendship. Eilish Ui Bhriain took on the challenge of describing a dramatic incident form her own personal experience with a heart-warming animal theme and introduced her story by talking of her love of dogs and cats and with special fondness recalled a cat of years ago who was so closely attached to her father to the point of springing out from the roadside undergrowth and walking back home with him. The central incident however concerned a dog she witnessed wandering apparently lost and abandoned in Patrick Street, Cork. The poor creature seemed destined for a sad end straying out into the traffic until it transpired that all the time he was under the watchful eye and command of a man on a bicycle. Eilish had skilfully built up the tension as we were all drawn into the story and waited in suspense for what the outcome would be: in its surprising nature, the ending was all the happier and we will long remember with special fondness this doggie tale told in such a relaxed, natural and easy style that underscored its uncertainty. Another notable feature of this speech was the use of the flip chart with illustrations of beautiful cats and dogs that were so charming and delightful, which drew the praise and admiration of evaluator Kevin Walsh. Timekeeper Tim Fitzgerald pictured with Tricia and Seoirse Neilan together with other members at the club meeting of April 24th 2018. The role of Timekeeper is essential at any meeting operating the system of green, amber and red lights marking the fifth, sixth and seventh minute of set stage speeches. At the red light speakers are expected to bring their presentations to their conclusion and resume their seats. Everyone is allocated the time in which to have their say and utilise it to the full. By significantly going under the allowed time a precious opportunity is left abbreviated for the entire time allocation should be used for the speaker to develop and share their thoughts, views and ideas and thereby helping to achieve their true potential. Going significantly going over the time is to take away the space that rightly belongs to someone else. It is a beautiful system of balance that sets limits not to restrain expression but to enhance it and is a wonderful discipline obliging speakers to cut away all superfluity and to clarify in our minds what we want to say in as light and economical a style as possible before yielding to the next person to rise and make their presentation. The efficient and optimum use of time is at the heart of the Toastmasters ideal. This also applies in the informal topics sessions with two minute contributions for the initial response and one minute allowed for add-ons, these time limits marked by the ringing of a bell by the timekeeper. Also a record of the duration of each speech and phase of the meeting is kept and read out as the Timekeepers’ Report at the summing up of the General Evaluator immediately prior to the final adjournment. Watching time at any Toastmasters’ meeting requires two hours of constant attention and precision and is vital to the running of a smooth and successful gathering. Tim performed his duties that evening to the highest professional standards set in our club over the years. At the bottom right corner of our picture can be seen the top of the speakers’ lectern, the universal symbol of eloquence and freedom of speech. Our President Kevin O’Neill addressed the ever difficult issue of road safety which he presented in a clear, direct and lucid approach, effectively using the flip chart to illustrate the changing pattern of accidents on our roads over the years. The most striking statistic was that in 1972, over 600 people died on the roads although there were far fewer cars back then, as compared to just under 160 in 2017. No doubt changed attitudes to drink driving go a long way to explaining the improvement, but the casualty figures remain far too high and represent such a huge volume of preventable human misery and suffering. Kevin laid bare the causes: alcohol, fatigue, defective vehicles, recklessness and distraction from mobile phones. He offered very sensible and good advice: don’t speed if you’re late, better to arrive late than not arriving at all. Remove distractions and put phones aside. Drive safely and save a life – it could be your own. Later evaluator Johanna Hegarty thanked Kevin for having shared with us a speech so full of wisdom, care and common sense. Finally we were received a very interesting illustrated lecture from Tom O’Keeffe of Limerick Toastmasters on the new developments in the educational programme of Toastmasters International known as Pathways and which will affect all members throughout the world after it becomes fully operative from 2020 onwards. There is much that is new and exciting about it, offering challenges to be sure but great opportunities as well. But not entirely without a certain feeling of unease for so much of it is based on use of the Internet, smart phones and futuristic technology. We need to find out so much more. 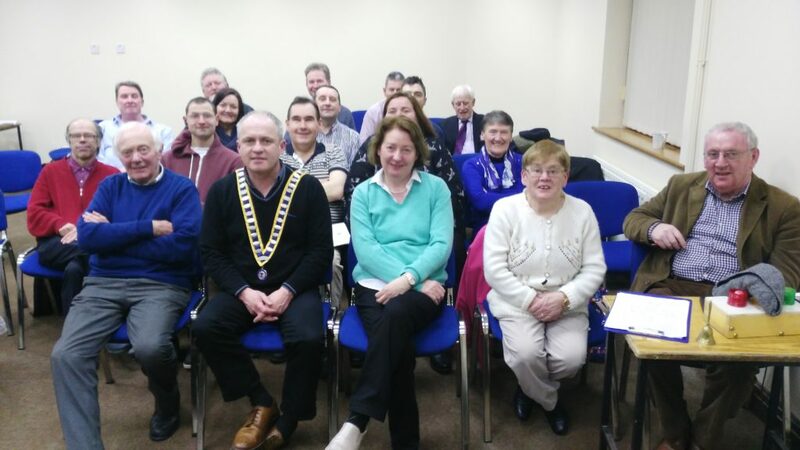 Every organisation must grow and adapt but at the core of what we do in Fermoy Toastmasters as in every club is the joy and pleasure and fulfilment of interpersonal interaction and the regular coming together in friendship and mutual goodwill with humour and fun that makes our meetings so memorably pleasant and entertaining. Long may that so continue: a sentiment so well expressed by our General Evaluator David Walsh. And so we come to the final meeting of the current season, our AGM that will be held on Tuesday evening next, May 8th at 8.15 pm in the Fermoy Youth Centre when we celebrate the accountability and democratic nature of our great organisation. We look forward to seeing you there. For further information, please contact Mary Whelan at 087 7971006 or Kevin Walsh at 058 60100 or log on to our mobile-friendly website toastmastersfermoy.com or find us on Twitter @ FermoyT. 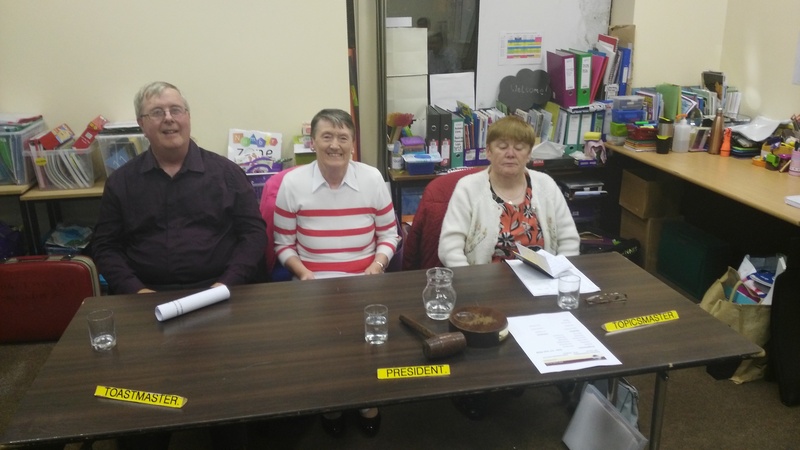 Fermoy Toastmasters held one of their best and most enjoyable annual Speech and Evaluation Contests on the evening of April 10th in the ever welcoming riverside Youth Centre. It has always been one of the great highlights of our year and on this occasion even greater heights were attained with the remarkably high quality of the speeches, the enthusiasm of the reception for the contestants and by such a very positive and genial atmosphere that made for a memorably special and richly satisfying evening. 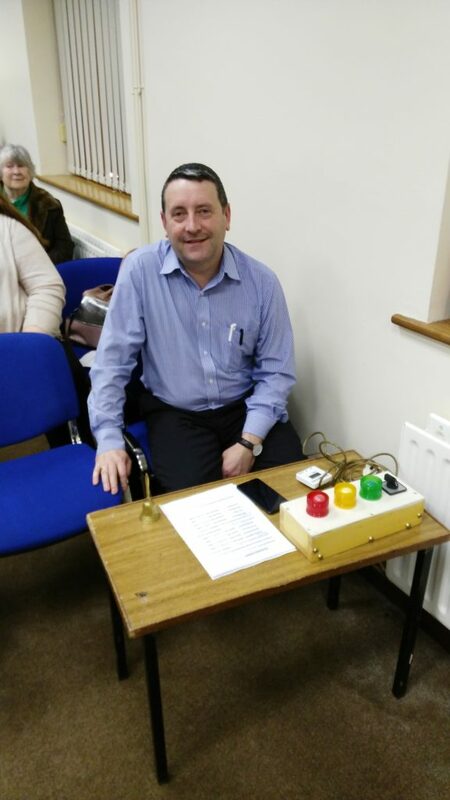 Calling proceedings to order Club President Kevin O’Neill extended cordial greetings to all after which control of the meeting was passed to Tim Fitzgerald who as Toastmaster or chairman carried us through the programme with an easy and assured style that greatly enhanced its success. Then we turned to the first of several relatively brief but hugely enjoyable and stimulating topics sessions with Topicsmaster David Walsh offering a varied selection of well-chosen and engaging subjects that got everyone actively involved with ready quickness of mind and ready spontaneity fostering a receptive and most positive atmosphere for the main event of the evening. 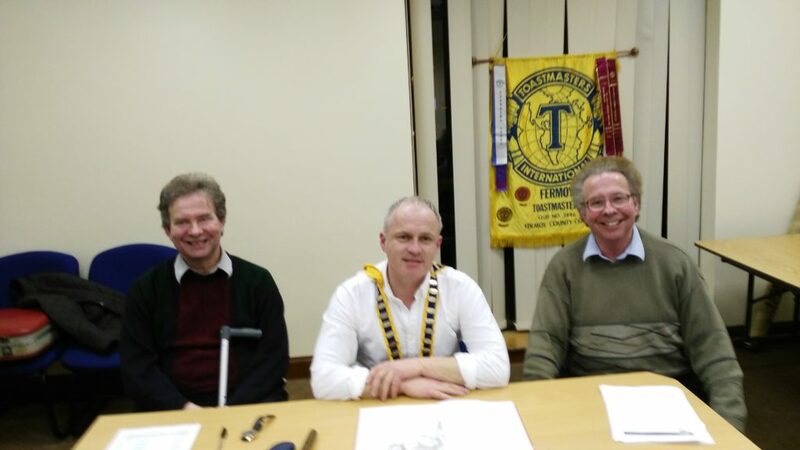 Club President Kevin O’Neill relaxing with club members John Kelly and Mary Whelan together with Timekeeper John Sherlock after the very entertaining annual Speech and Evaluation Contest held on April 10th 2018. Second from right in the 2nd row is Area Governor Liam O’Flynn present for the occasion. It is important to remember that brevity is of the essence of Toastmasters at all times but never more so than in competition as the green light comes on at five minutes, amber at six and red at seven which stays on until the speaker is finished. If any speaker goes over the final thirty seconds of grace, they incur instant silent disqualification. It is a salutary and very powerful discipline that brings out the best in everyone. Our first speaker was Kevin Walsh who gave us a refreshing and gently challenging talk on how a stranger can be viewed with concern and even suspicion but equally a stranger might just be a new friend whom you have yet to know. He recounted his own personal experiences of meeting people who instantly and surprisingly opened their hearts and showed warmth, kindness and friendship. Once initial cool reserve has melted warm and genial welcome can so often take its place. We are all strangers somewhere and to other people leaving us but to ask for acceptance that can lead to fascinating discoveries of the real beauty of other people and of life. Next up was Jerry Hennessy who evoked the ancient art of ploughing by which the soil is made yield up its abundance and fruitfulness, ‘the mist where genesis begins’ as Patrick Kavanagh once put it. The skill and precision of generations of ploughmen following the slow patient shire horses later superseded by the insistent power of the tractor is uniquely celebrated here in Ireland at the annual National Ploughing Championships of which Jerry has always been a dedicated follower. Charting the history of this great iconic event from its modest origins in the 1930s under the direction of early pioneers like JJ Bergin and Sean O’Farrell and its later immense expansion by Anna May McHugh who began her association as a young helpful office girl before going on to assume the mantle of leadership and inspiration. A brilliant and remarkable woman who half a century and more later has brought the Ploughing Championships to a pinnacle of success and a tremendous celebration of rural life drawing tens of thousands of visitors every year, a real triumph of imagination and vision combined with that innate Irish love of the land and nature. Jerry’s speech was a most affectionate and well-drawn affirmation of what has become a great milestone in the annual calendar of life on this island. Frank O’Driscoll delivered a beautiful speech based around the philosophy of one of his great sporting heroes of the past, golfer Walter Hagen who at a very dark and troubled time in the world between two periods of war and conflict, represented courtesy, refinement and stately accomplishment, his philosophy summed up in his saying ‘never hurry, never worry and always smell the roses along the way’. Frank’s message is timeless: that beyond all of life’s troubles and upsets, there is always something more, something serene, restful and filled with a spirit of peace. It was illustrated in the story of two little rabbits trapped in a vat of cream, one tires and gives up the struggle and sinks down, the other keeps going and tries to go on swimming until the liquid turns to butter across which he runs to make his eventual escape. Keep going, keep trying, never give up, enjoy what delights life may bring in the journey and trust for the rest that all will somehow turn out bright and well. This was the kernel of an expansive presentation given in a gentle, measured, easy-listening style, and yet full of profound truth and insight all the more impressive and compelling for its quiet apparent simplicity, with a genial smile and placid wisdom reaching to the bright shoreline of great promise. 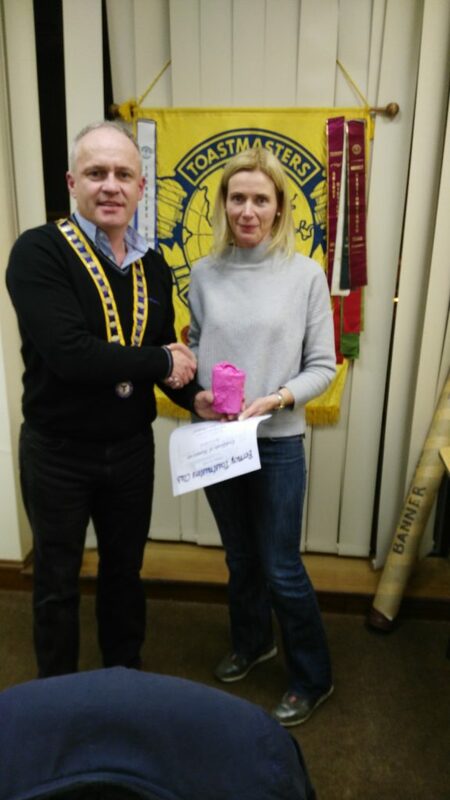 Club President Kevin O’Neill presents Michelle O’Brien with her Runner-Up Prize in the recent Club Evaluations Contest. Finally, Mary Whelan gave us a gem of a speech delivered with flawless grace and poise celebrating friendship and kindness as seen in those glowing embers that come out of the past in the form of journal entries recording holiday and Christmas joys, the pleasure of receiving a postcard from someone holidaying in a distant and beautiful place and a few well-chosen words of greeting that give you the sense of being there knowing that the sender has taken so much time and thought to write and post this to you. The card can be saved and looked at again even years later while the text message is fleeting and soon erased. Then too by not throwing out what some might think of as clutter, old letters can resurface years later like a note from a twelve year old boy expressing thanks for a lovely day out. Now as an adult he enjoys great success in his professional field, but in that note he remains forever a boy forever happy and grateful in simple carefree pleasures. Mary concluded by pointing out how our coming together in these entertaining meetings forges the bonds of shared comradeship and friendship in Toastmasters and the wider world. Club President Kevin O’Neill presents Frank O’Driscoll with the Niall Brunicardi Perpetual Trophy as Club Speech Contest Winner 2018. The trophy was presented to the club by our First Founding President Niall Brunicardi to be presented every year to the first placed speaker in the annual speech competition celebrating the noble ideals of excellence in communication and leadership and the pleasures and joys of lasting friendship. There could be no better or worthier winner than Frank who is one of our most cherished and popular members and dearest friends. After our convivial tea break, we then had our second competition of the night in the art of Evaluations where guest speaker and Mallow Club President Helsa Giles, shared with us as her love of fashion and elegance, drawing from a travelling case a whole sequence of some of her favourite dresses, stylish and sophisticated creations that help her to project her bright and vivacious personality to the world. In the pleasure of couture, Helsa proclaims her enthusiasm for life and its richness. Five contestants then left the room to be recalled back one by one to give their widely varied assessments of what they had just heard: Fanahan Colbert, John Kelly, Michael Sheehan, Padraig Murphy and Michelle O’Brien. Each with their own perspective, all united in admiration for a speech so wonderful to listen to and so visually stunning, a truly outstanding and brilliant achievement. Then after the judges’ score sheets were totted up and the votes had been counted, the results were announced: in the Evaluations, First Place and Runner-Up Speakers were Fanahan Colbert and Michelle O’Brien, while Frank O’Driscoll was the well-deserved and very popular Winner of the Speech Contest with Kevin Walsh as Runner-Up, both warmly congratulated and presented with their prizes. All four will represent Fermoy in the Area Contest in Mallow on Thursday, April 19th, at the Hibernian Hotel Mallow at 8 pm. 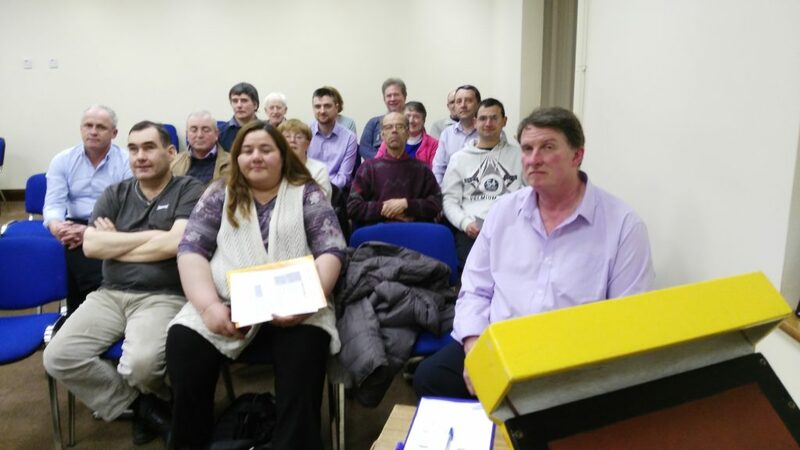 We then look forward to our next regular meeting in Fermoy on this coming Tuesday, April 24th, at 8.15 pm. For further information, please contact Mary Whelan at 087 7971006 or Kevin Walsh at 058 60100 or log on to our mobile-friendly website toastmastersfermoy.com or find us on Twitter @ FermoyT. 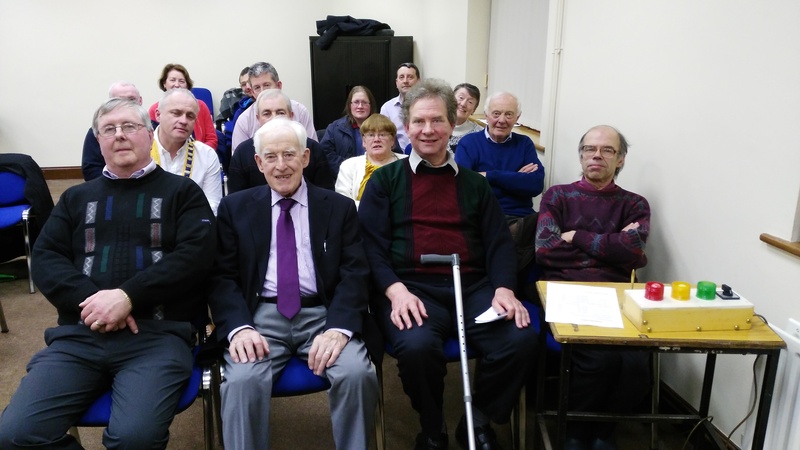 On the evening of March 27th, the Tuesday of Holy Week, Fermoy Toastmasters enjoyed a memorably pleasant and delightful meeting at the riverside Youth Centre. Like so many of the best of things in life, the beginning was a little unpromising as two out of our three speakers on the programme were obliged to cancel at the last minute due to unforeseen circumstances. This posed a significant challenge to us but as has happened previously time and again the character, the commitment and the indomitable spirit of this club rose to the occasion and shone through with success and distinction. As ever our Club President, Kevin O’Neill, bid the members and guests warmly welcome and set a relaxed and easy tone for the next two hours. Thereafter the task of chairing the meeting falls to the Toastmaster of the evening who takes control of proceedings and guides things along, moving from one phase to the next, introducing the speakers and maintaining a natural and smooth continuity and explaining helpfully with particular emphasis for the guests present the purpose, role and function of each participant and ensuring a warm and genial atmosphere. In this capacity our Toastmaster, Mary Whelan, once again turned in a performance that was smooth and assured, enhancing the meeting with aplomb and ready efficiency together with all of her ever winning charm and grace. 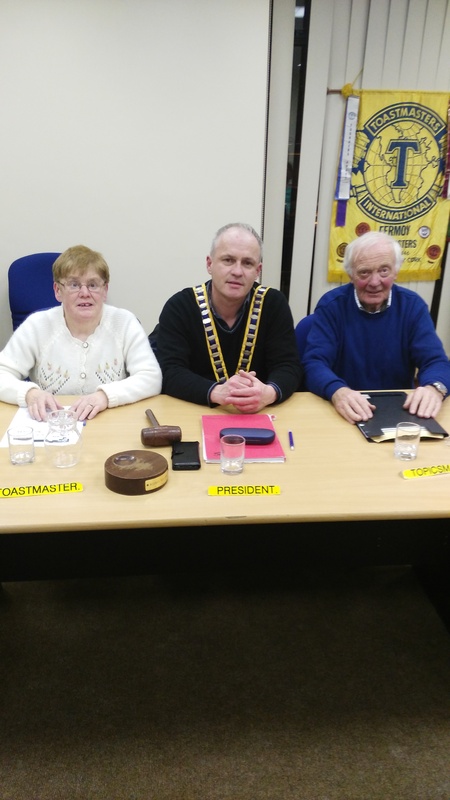 The Top Table:- Club President Kevin O’Neill with Toastmaster and chairperson of the evening, Mary Whelan and Topicsmaster Kevin Walsh. I have spoken here before on the pivotal role that the Topicsmaster plays selecting themes on which speakers and contributors are asked without any prior notification to share the fruits of their quickness of mind and readiness of response. Topics are wonderful because of their immediacy and freshness and ever so wonderfully stimulating. They can be about virtually anything but of course as the word implies matters that are to the forefront of news and current interest are often chosen. For instance our Topicsmaster on the evening, Kevin Walsh, began by presenting an item featured on that evening’s television news, namely the closure of Cork’s principal thoroughfare Patrick Street to regular traffic for several hours each day, an arrangement that had just then been put in place. Even on that initial topic, from the very outset so many people wanted to get involved offering a most engaging and fascinating variety of views and opinions, many expressing doubts about the whole project fearing it will lead to intensified gridlock in the city centre; others welcomed the new initiative recalling the acute difficulties with parking experienced especially by commercial truck and van drivers over the years. Some looked forward to a new era of a relaxed and placid civic space and shopping area; others believed the whole venture will end in utter failure. Tim as ever will tell. We then moved onto the issues surrounding the expulsion of a diplomat from the Russian Embassy in Dublin: while the need to act was understood after the recent disturbing events in Salisbury, England, an air of caution was also expressed that international tensions needed to be contained and that as diplomats are a vital source of communication between states, that any further expulsions should be avoided so that dialogue can continue unhindered, calling to mind Winston Churchill’s famous maxim that ‘jaw jaw is better than war war’. Later after the tea break on a not unrelated theme we had an hilarious response from Frank O’Driscoll when asked on his being cast as the next James Bond, looking forward to how 007 always ensures the bad guys get their comeuppance and the glamorous girl at the end of every movie into the bargain! Then too the saying that a broad mind and a narrow waist exchange places in middle age, drew the thoughtful and measured response from David Walsh that while physical appearance may adapt to the passage of years, minds do not narrow so much as deepen with the enriching wisdom that only the experience of life can teach. Everyone was having and enjoying so much fun and really getting behind this topics session both before and after the tea break, so much so indeed that despite the additional time available, the Topicsmaster did into have opportunity or need to ask each individual member a separate topic as the profusion of add-ons from all present showing an eagerness to get involved and to actively participate with such enthusiasm and zest which sums up the spirit of this great and wonderful club in Fermoy that brings so much pleasure, satisfaction and happiness to all. We had just one prepared speech that evening but it was a very fine one indeed from Tim Fitzgerald. The challenge of his assignment was the use of vocal variety, of rate, pitch and tone of voice to amplify and underline meaning and to reinforce the clarity of the message. What followed was a salutary tale from Tim who engaged fully with his listeners on the recent difficulties and hassle that he encountered while doing a little online shopping. He was attempting to obtain a small consignment of a certain brand of shampoo which is not available in conventional retail outlets. He paid for the item which had to be shipped from America and awaited delivery… And he waited…. And he waited…. And he waited for weeks on end before finally having to contact the supplier who then after further delay and confusion admitted the package was mislaid and had to resend it. Later he was contacted by the Customs & Excise Service incurring yet further costs. All of this involved a lot of contact by email and through the phone network what should have been a fairly simple and routine transaction became endlessly prolonged and complicated. But Tim took it all in his stride and with his relaxed affability and inexhaustible patience that goes with the best and most understanding of natures, saw everything through to the end while appreciating its magnificently funny side. It was such a lovely and very enjoyable speech to listen to, expressive of frustration but above all showing an awareness of how when seen through the lens of humour so much of life’s everyday difficulties are seen in a smiling light. Later his evaluator David Walsh praised him for such an admirable achievement where vocal variety had been used so readily and effectively to make the story come alive and emphasising that direct personal experience is always the richest mine of speech material and inspiration. Club President Kevin O’Neill with members and friends after the very enjoyable meeting of March 27th 2018. At the back of the room stands our Meeting Organiser John Sherlock happy that the evening had proved so successful. There is of course no substitute for the warmth of human interaction and personal encounter which lies at the heart of all our activities. That is what we celebrate and affirm at every Toastmasters meeting throughout the year, a fact that was well stated by General Evaluator Jerry Hennessy in his concluding assessment of the meeting where the club had shown brilliantly how when challenged had put its best foot forward and scored a truly remarkable success. And now we look forward to the biggest highlight of our year with the annual Club Speaking and Evaluations Contest that forms part of the great worldwide Toastmasters competitive pursuit of excellence in the use of the spoken word with great fulfilment and enjoyment. We look forward to welcoming you all to a very special evening on this coming Tuesday, April 10th, in the Fermoy Youth Centre at 8.15 pm. For further information, please contact Mary Whelan at 087 7971006 or Kevin Walsh at 058 60100 or log on to our mobile-friendly website toastmastersfermoy.com or find us on Twitter @ FermoyT. 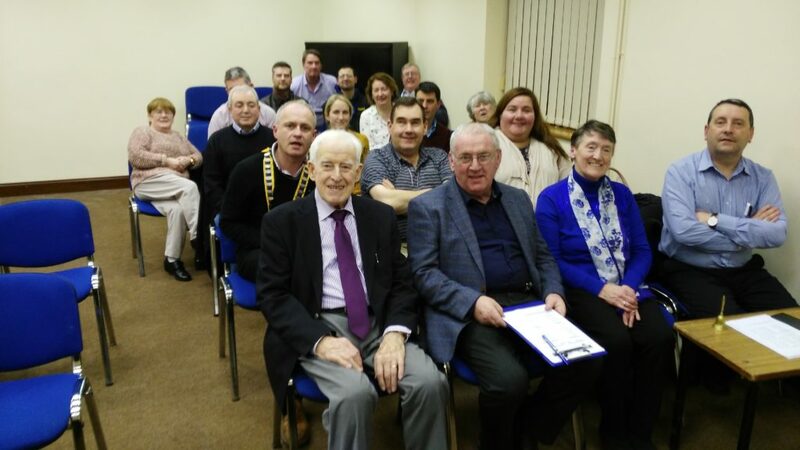 After a weather-enforced one month break, it was such a joy and pleasure for all of us to gather again at the ever welcoming riverside Youth Centre latest meeting of the Fermoy Toastmasters Club on the evening of Tuesday, March 13th. The gavel sounded and Club President Kevin O’Neill called proceedings to order and once again we were gladly underway. 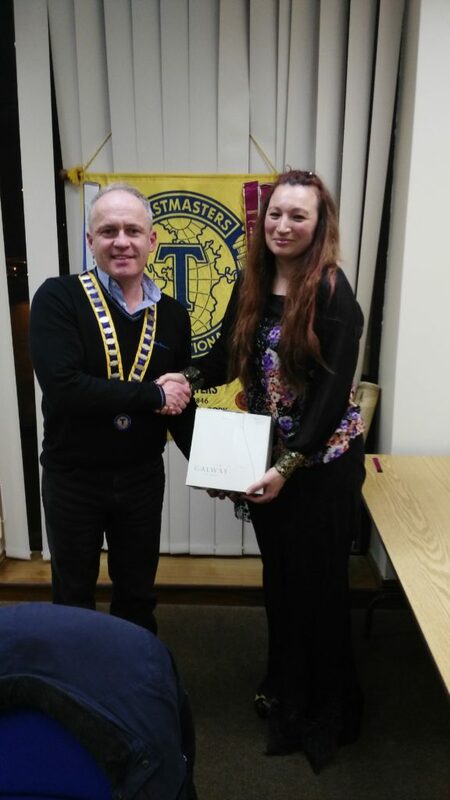 Having expressed his happiness at seeing a room full of smiling happy faces, control of the meeting for the next two hours was handed over to the Toastmaster of the evening, Johanna Hegarty, who carried things forward with precision, alacrity and grace. There is a beautiful skill in chairing a meeting and ensuring that everything goes along smoothly and effectively, one of the most essential and rewarding aspects of the craft of Toastmasters and Johanna is in this as in every other respect, an outstanding and shining exemplar. 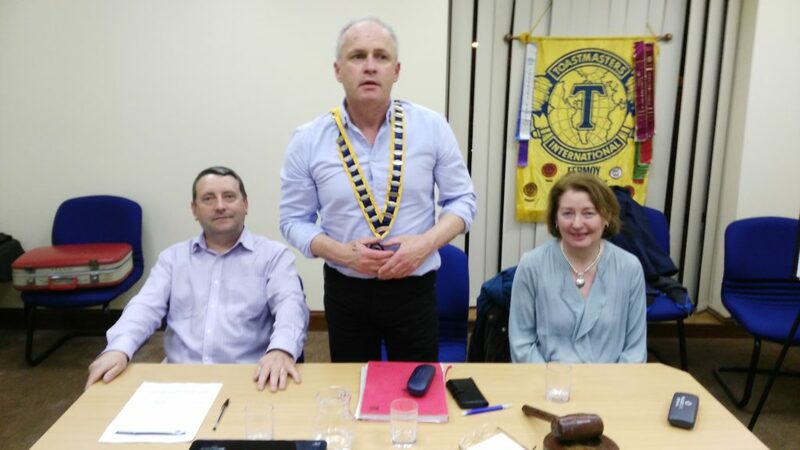 A good top table always ensures a good meeting, as was most certainly the case on March 13th 2018 with Toastmaster and chairperson of the evening, Johanna Hegarty and John Quirke (right) acting as Topicsmaster, with our esteemed President Kevin O’Neill in the chair. The success of Toastmasters and of all of our activities is not just about any outstanding individual performances – though we are showcase for such excellence all the time – but rather on the fusion and the blending of all the talents and the creative energies of everyone that leads to great achievement and the heights of success. Soon we were launched into the topics session where members are invited to speak on any subject about which they have received no prior notification for an initial two minutes with one minute subsequent add-ons. This is always ever so stimulating and expansive, getting everyone to reach into themselves on the spur of the moment and find something new, refreshing and engaging to share and express. All the more so when the topicsmaster is John Quirke who with all of his wisdom, insight and experience brought to us a range of themes whimsical, humorous, profound, light-hearted and original that got everyone actively involved and fostered a lively and scintillating atmosphere. For instance Robert Hegarty gave a wonderful account of his recent use of a flight simulator which with his great passion for aviation he found so exciting and fantastic and keenly encouraged us all to check it out for ourselves: listening to him we truly felt the thrill of shaking off the chains of gravity and seeking to climb above and beyond the clouds in that same spirit of adventure that led the early pioneers to take to the skies. On the theme that having no charity in the heart is the worst sort of heart disease, Mary Whelan drew lessons from how the country coped with the recent blizzard conditions, the worst of weather bringing out the best of people, with everyone pitching in helping out neighbours and friends in every way they could, concluding by asking why can’t we do more of that all the time and what a better and happier world it would be. Then too Frank O’Driscoll addressed the issue of there being no sadder sight than a young pessimist, observing so wisely and astutely on how materialism has so pervaded today’s society setting unreachable expectations that make many young people deeply frustrated and disillusioned, whereas real fulfilment and happiness can be found in the joys of family life and togetherness, from the simplicity of having enough to get by, engaged in satisfying work and from the comfort of knowing that come what may hope forever springs form the human heart. 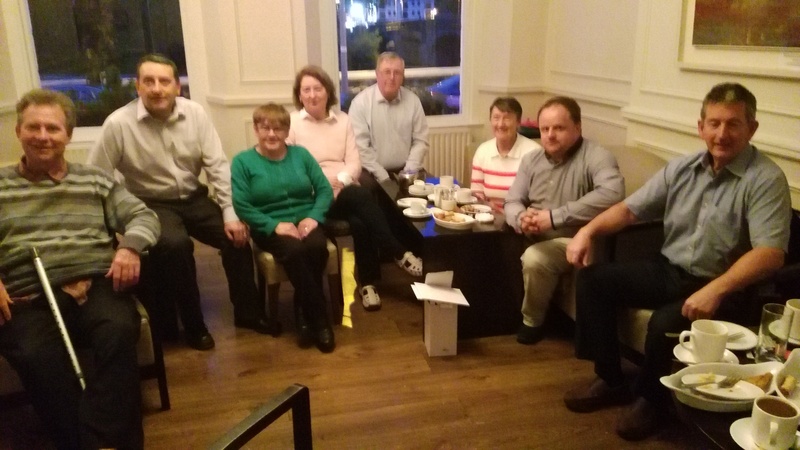 Club President Kevin O’Neill relaxes with club members after our very enjoyable and successful meeting of Tuesday, March 13th 2018. The chain of office around Kevin’s shoulders symbolises the club’s continuity and tradition spanning almost half a century. But it is not merely a celebration of past achievement but also proclaims our belief in a bright future of great promise. Before we rose for our ever pleasant and relaxing tea break, we had three fascinating stage speeches, all of which were framed to a set purpose. Seoirse Neilan took on the persuasive presentation and chose as his theme Ireland’s relationship with the EU in the light of Brexit. He recalled over the years his own strong pro-European stance in every successive referendum and pointed up the bloc’s achievements in free trade, free movement of people and the attainment of the single currency. But with that doubts have also crept in as the Union becomes ever more complex and compelling, the gap between the European institutions and the people grows ever wider, and the treatment meted out to this country at the time of the bailout was indeed harsh and vindictive. Seoirse stopped short of urging us to follow the British path, but his sounding of a doubting note and a call for more debate on where we are headed in Europe was most timely and cogent. Evaluator Frank O’Driscoll in his assessment spoke of how this thoughtful and well-structured speech had touched on a crucial issue that affects all our lives. It is always such a pleasure whenever Eilish Ui Bhriain comes to the lectern, on this occasion taking up the delightful challenge of giving a humorous speech in which she evoked the richness, the community spirit, the colourful characters, the storytelling and the love of Irish language and culture in her native West Cork which she brought alive to her listeners with all of her immense charm and warmth of heart. And what stories she told us. Like that of the woman who went to confession every week telling the same sin – ‘Father, I committed adultery’ – until at last the priest had to say to her that she must no longer trouble herself about this as everything was forgiven, to which the penitent replied, ‘I know that Father, but sure I love talking about it’. Or of the time when American visitors were expected and her mother baked a delicious currant cake for them: but while no one was looking the dog made off with it to gratify his sweet tooth. But all was well for with plenty of great chat washed down by copious glasses of port, the evening turned out a most memorable success. Evaluator David Walsh later expressed his enjoyment and that of all of us at such a lovely and most entertaining portrayal of great people who knew how to celebrate the true joys of life. Another view of the March 13th meeting. On the extreme right is John Sherlock, our brilliant Meetings’ Organiser or EVP and timekeeper of the evening who carefully observed the lights and the duration of all speeches and of each phase of the meeting, underlining the emphasis that Toastmasters’ places on the making the most efficient and concentrated use of limited time available. The limitations on time do not act as a barrier however to creativity and participation, but rather serve to clarify and enhance the use of thought, speech and gesture that are interwoven to make the enjoyable, uplifting and memorable speech and impromptu contribution at the topics. Fanahan Colbert brought to us the beauty and elegance of the guitar, displaying the instrument in all of its classical style and proportions, its exquisite craftsmanship and that rich mellow sound of string and hollowed spruce that was so pleasing to the ear and satisfying to the soul. Then Fanahan connected up an electric guitar with accompanying speaker, exemplifying one of the greatest post-war musical innovations, born of the genius of Leo Fender, creating that defining sound of modernity at once strikingly confident but also searching for deeper meaning that fills the repertoire of Bruce Springsteen and so many other performing legends of our times. Having charted the rapid evolution from telecaster through to Stratocaster and beyond, all too soon the presentation of words and music had concluded when we would so dearly liked to have heard more. Evaluator Patricia Neilan afterwards spoke of the positive feeling that flooded the room and said ‘sing us a song next time’: and so say us all! 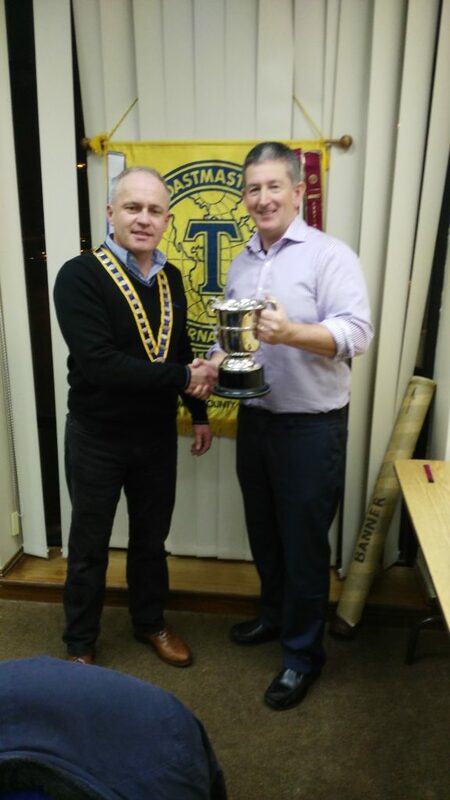 We were honoured by the visit of our Area Director Liam O’ Flynn who rejoiced in the club’s success and whose remarks were ever so encouraging and heartily appreciated. Proceedings were wrapped up so pleasantly by John Kelly as General Evaluator who spoke of having so enjoyed such a very lovely evening and glad of the opportunity to be part of it all. The joy of every meeting is that immediacy and freshness, that mutual friendship and generosity of spirit that makes everyone so very happy and sends us home joyously elated time and again. And so we hope that you may join us at our next meeting on this coming Tuesday, March 27th, at 8.15 pm in the Fermoy Youth Centre. For further information, please contact Mary Whelan at 087 7971006 or Kevin Walsh at 058 60100 or log on to our mobile-friendly website toastmastersfermoy.com or find us on Twitter @ FermoyT. The meeting of the Fermoy Toastmasters Club scheduled for Tuesday, February 27th, was cancelled due to the severe weather of our recent Arctic Spring. Through all of our very many years, it is remarkable how few of our intended gatherings have ever had to deferred owing to the capricious vagaries of the elements but obviously sometimes it will happen and while everyone is disappointed about that, the safety of our members and friends is always our first and overriding priority. But nothing lost or daunted for now we turn our sights and our minds to our next meeting on this coming Tuesday, March 13th, at 8.15 pm in the Fermoy Youth Centre. The hoped for long warm summer days are still several months off but now we bring forward our version of springtime full of promise and hope, eagerly and happily planning, preparing and enjoying many more hugely enjoyable, heart-warming and brilliantly effervescent meetings with the ever motivating leadership of our President Kevin O’Neill and the untiring commitment of our Meeting Organiser, John Sherlock. Also the annual speech contest season is approaching and that too will be a time of very special and intensely pleasurable activity. Our outlook is ever positive and optimistic because we all participate in and share the fruits and the delights of activities that amply enhance and illuminate the lives of us all. Toastmasters is never about standing still, but moving ever forward. It is not about merely looking back on past achievements with pride and gratitude as we do, but as already said we joyfully look forward to attaining our future goals and building on personal growth towards ever greater achievement. In Toastmasters there never comes a time where anyone can say they have done it all. Instead the excitement of new challenges ever beckon as together we strive with light and cheerful step in friendship and mutual goodwill to explore and realise our fullest potential. That is what makes all of our meetings and activities so stimulating and refreshing. We are ever on the move sharing our talents and energies to push back the boundaries of possibility, to give ever more of ourselves so that together we each receive an ever greater sense of personal satisfaction and pleasure in a spirit of great fun and mutual enjoyment. They say that the shortest and the hardest word to say is no. In fairness we all have to say it sometimes for very good reasons. But all too often when someone says no they can be turning away from a bright prospect in life and slamming the door on a brilliant opportunity by refusing to contemplate the possibility of change and of doing something different and stimulating. How easy it can be for all of us as individuals to limit ourselves and to set tight boundaries that cut us off from life-giving alternatives. All too often what comes from saying no is merely a sterile nothing. Instead Toastmasters is a warm and ever open invitation to come and say YES to setting out on a new course and a new vision. Saying YES to going forward with generosity of spirit and conviction to gain proficiency in the beautiful arts of expression and communication leading to ever higher personal development, confidence and achievement. It is about saying YES to a brilliant source of renewal, entertainment and pleasure with conviviality and bonhomie. In a word it is all about saying YES to a celebration of the pure joy of life. And the secret of success in all things is enthusiasm. We all do well what we like doing best. For to be full of enthusiasm is to cast aside all doubts and constraints, to tap into the inner energy and zest that all people have and once your heart is truly in all that you strive for and seek to pursue, whether in the sphere of business and work, at home and in the family or joining in community or leisure activities, if your heart is truly in it, if what you do is your passion, then you will always find a way, your courage will never falter and there is no limit to how far you can go on the road of lasting happiness and fulfilment in life. What all of us who participate in Toastmasters never cease to be amazed by is the discovery of just what we can do and how far we can go just by making that modest effort with belief in ourselves and how special each of us are. Nothing worthwhile can ever be achieved without taking that vital step and making that all-important effort. And we are not alone for we are together in friendship building each other up and having so much fun along the way. For it is all a matter of letting new horizons fire our imagination and growing ever stronger and happier not by trying to imitate others but rather by each and every one of us simply being ourselves with our own thoughts and words and following our own path at our own comfortable pace. It is lovely to come into a bright meeting room sharing a pleasant convivial atmosphere. The gathering is called to order and soon we are experiencing the joy of standing up for a few moments to express our own immediate and impromptu thoughts, experiences and insights about life in the topics session. To listen to the range and diversity of views, stories and opinions is just so immensely stimulating and mind broadening, finding in turn that it enables us to reach inside and generously share that originality and uniqueness that truly is our own. It is an immensely liberating and empowering experience, one that makes you feel good and positive inside. Then you discover the wonder and the joy of going to the lectern for a few short minutes to give a talk about something that matters to you. Looking down on a room full of smiling faces wishing the very best enables all of us to give of our very best in turn and to experience the thrill of it all, the wonder of what we can do, finding in the brevity of the speeches not a curtailment of self-expression, but rather an essential cutting away of all that is unnecessary and superfluous, to clarify our ideas and to give them wings in a light, economical and easy listening style, then sitting down with genuine satisfaction inside at having achieved something truly good. And knowing too that our contribution receives the further enhancement of positive feedback by way of evaluation offering no criticism but praise of all that has been so well done and suggested ways to become even better. We are all together seeking the rainbow of an ever better life on a sweet and happy never ending journey. The entire experience is just so immensely uplifting, stimulating and remarkably joyful. No wonder that so many find that they return home from our meetings feeling refreshed and elated and a great sense of looking forward to the next. As I do myself even after years of active club involvement. We hope that you will come to enjoy our next meeting on this coming Tuesday, March 13th, at 8.15 pm in the Fermoy Youth Centre and will look forward to seeing you all. For further information, please contact Mary Whelan at 087 7971006 or Kevin Walsh at 058 60100 or log on to our mobile-friendly website toastmastersfermoy.com or find us on Twitter @ FermoyT. 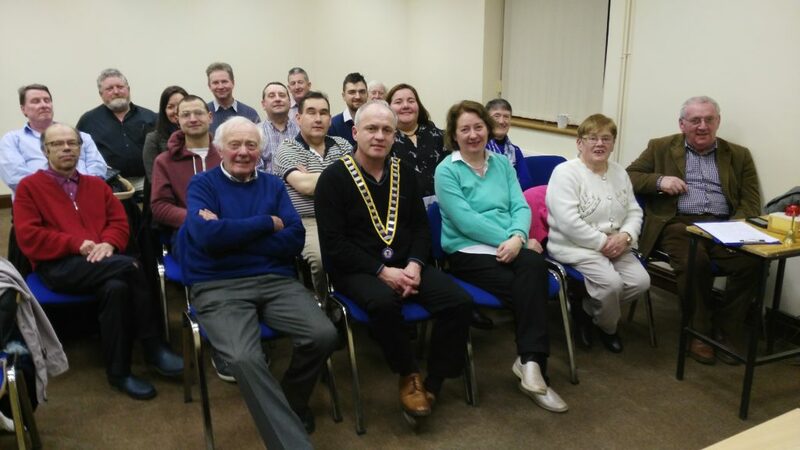 For Fermoy Toastmasters its all the way to a happier and better life as once again we gathered for the third meeting of 2018 on the evening of Shrove Tuesday, February 13th at 8.15 pm in the generous hospitality of the local Youth Centre. For brothers David and Kevin it marked a significant footnote in club history as it was the first time that they had both served at the top table on the same evening, Kevin as Toastmaster and David as Topicsmaster. It was a pleasing and satisfying moment. 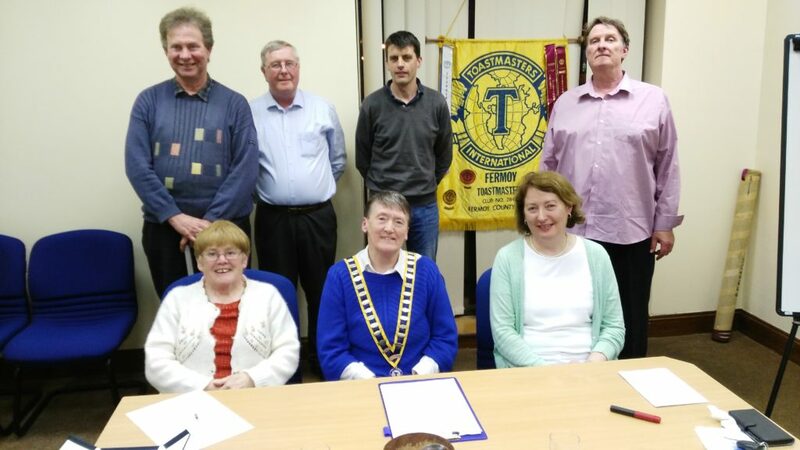 On these late winter evenings it is such a pleasure to attend and take part in the meetings of the Fermoy Toastmasters where in such a friendly and cordial atmosphere one may enjoy such an incomparable richness and variety that makes for a truly memorable and most enjoyable time. ‘Topicsmaster David Walsh (right) and Toastmaster Kevin Walsh with Club President Kevin O’Neill’. Having struck an ever warmly welcoming opening note, Club President Kevin O’Neill then handed control of proceedings to Kevin Walsh as chairman who guided things along and introduced the speakers and participants in a genial and pleasant manner. Tributes were paid to Helene Brunicardi on the sad occasion of her passing: daughter of our founder Niall of cherished memory, she was a prominent member of Toastmasters and onetime President of the Killarney Club, making a huge contribution to the organisation, widely honoured and respected with the warmest affection for her affability and great kindness. May she rest in peace. With a well-chosen selection of themes, David Walsh presented a lively and entertaining topics session, getting everyone involved and actively taking part with refreshing spontaneity. An initial respondent is asked to speak on any theme without prior notice for two minutes followed by one minute add-ons from other contributors offering new and stimulating insights. John Kelly spoke so well on the gimmickry surrounding the sale of cars nowadays as one moment we were told that petrol was finished and diesel was the way to go; now diesel is dead and we are asked to upgrade to petrol, while the age of the electric car beckons with their limited range and painfully slow recharging times. On the eve of Valentine’s Day with the giving of flowers, one of our new members Anne Marie Shepherd spoke of how touched she had been when a woman friend from Germany sent her a floral bouquet to wish her well after a recent injury from which she is now making an excellent recovery. John Quirke evoked the snow-covered winter of 1947 with all the high spirits and innocence of a young lad delighted the schools were closed, out playing with friends, recalling the bright nights when moonlight was reflected brilliantly from the icy landscape. Perhaps in our high-tech age, we have lost something of that carefree youthful simplicity, leaving our society with an epidemic of teenage depression. We all need fun at every phase of our lives – and it can still be found in Toastmasters. Three delightful speeches made for a truly memorable listening experience. Mary Whelan told with charm and grace the fascinating story of Deborah Mitford, whose birth into English aristocratic privilege was entirely omitted in the family diary in favour of the chimney having been swept that day. Such was the lack of expectation that surrounded her. But the girl soon showed her mettlesome spirit and during the austere war years, did not flinch from the drudgery of milking by hand with her face often spattered by the swishing dung-covered tails of the unheeding cows. Later she would go on to win the heart and hand of Andrew Cavendish, Duke of Devonshire, becoming mistress of Chatsworth House and Lismore Castle and was widely admired and respected for her elegance, compassion, depth of character and convivial sense of humour combined with an acute business sense and openness to innovation that made her a universal favourite. Mary always speaks with such clear enjoyment and ease that makes her visits to the lectern such a great joy and pleasure. She was praised by evaluator Fanahan Colbert for a presentation that captured the varied facets of a richly diverse and engaging life. With an assignment to illustrate an abstract theme, Jerry Hennessy then tackled the long and complicated relations between Ireland and Britain, but instead of looking at things from a typically nationalistic perspective through a glass darkly, he encompassed all of the very many good and positive things that have come out of the long association of our two islands in a message that was as timely as it was illuminating. Britain’s imperial heritage has given us fluency in English, the nearest thing the world has to a universal language spoken by some one and a half billion people, with all the access and opportunities that go with that. Jerry told us some very interesting facts such as the reason why motorists drive on the left here is merely a continuation of the practice of the old stage coach drivers who had to keep to the left as otherwise the cracking whips used to urge on the teams of horses would snag in overhanging trees and foliage. He also reminded us of the popularity of English dances such as the waltz and foxtrot that have provided so much gaiety and enjoyment to very many people even today; the mobility and convenience of the bicycle and the building of our national rail network that ended hopeless isolation and opened up the world and all its possibilities to generations. In these and many other telling examples Jerry encapsulated so much that makes our nearest island a good neighbour far better than a relative which served as the intriguing title of his speech. Later Johanna Hegarty complimented him on giving so many fresh and thoughtful new insights on a subject that all too often we think of as entirely painful and fraught. Then Frank O’Driscoll took us to the movies and the many lovely and enjoyable evenings he has spent through the years in the cinema looking up out of the dark auditorium at the vast literally larger-than-life screen with its world of fantasy, drama, colour and entertainment. In his easy and relaxed style, Frank stood aside from the lectern and holding his glasses in his right hand and with a beaming smile recalled those great classic films like The Sting and The Deerhunter and Butch Cassidy And The Sundance Kid. All of this was revived by a recent visit to the Mahon Point cinema to watch Three Billboards Outside Epping Missouri and what really delighted him was that here was a new film with a powerful Irish input that was every bit as good as any of these great classics. John Sherlock as evaluator saluted this remarkable achievement whereby images on a big screen were magically transformed into beautiful word pictures. Jerry Hennessy; John Kelly, Kevin Walsh Michael Sheehan, Timekeeper for the evening with the green, amber and red lights in the foreground. General Evaluator Eilish Ui Bhriain spoke on behalf of all for the delight and entertainment that we had shared together in such a rewarding pleasurable evening sending everyone home feeling so very happy. And that is what happens at every meeting of Fermoy Toastmasters – the gladness that everyone has for having come and taken part. We look forward to welcoming you to our next such gathering on this Tuesday, February 27th, at the Fermoy Youth Centre at 8.15 pm. For further information, please contact Mary Whelan at 087 7971006 or Kevin Walsh at 058 60100 or log on to our mobile-friendly website toastmastersfermoy.com or find us on Twitter @ FermoyT. 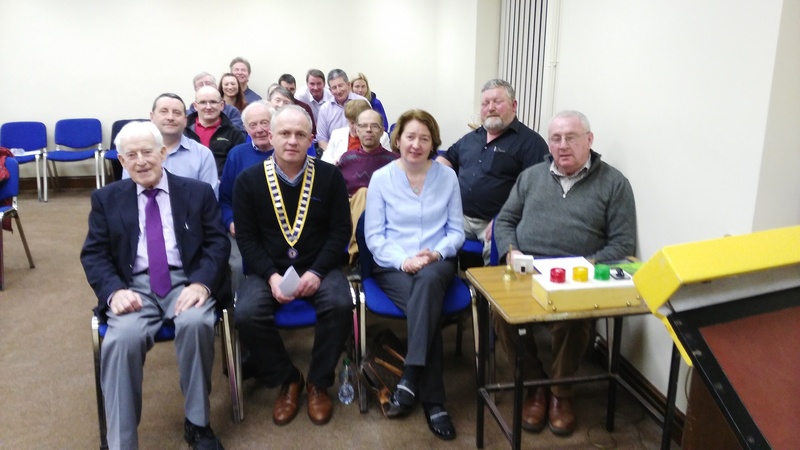 t is indeed a very great pleasure to evoke the recent meeting of the Fermoy Toastmasters Club on Tuesday, January 30th. A truly wonderful meeting, lit up by great humour, a warm and bubbly atmosphere, a great spirit of enjoyment and good cheer with a very large attendance, a truly memorable and delightful occasion, a meeting that makes you so happy and proud to belong to such a lovely and very special circle of friends. Club President Kevin O’Neill presides over the most enjoyable gathering of January 30th 2018. In this task he was so well and happily assisted by Toastmaster of the evening, Eilish Ui Bhriain and Topicsmaster Tim Fitzgerald. Club President Kevin O’Neill extended cordial greetings to all and expressed happiness at seeing the room so full of smiling joyful faces. He then passed control of the meeting for the following two hours to Eilish Ui Bhriain who in her role as chair or Toastmaster of the proceedings from the very first set a welcoming and relaxed tone that animated the entire gathering and did so much to ensure it was the successful and exuberant occasion that it most delightfully was. Just by being her ever charming and pleasant self, Eilish carried things forward gracefully and seamlessly, with geniality, humour and an easy winning style, that fostered such a lovely and engaging sense of occasion. There then followed the first of two topics sessions, that phase of every meeting that goes to the heart of everything Toastmasters are all about, the moment for spontaneity and immediacy, for quick thinking and the stimulus of the free flow of ideas and instant contributions that gets everyone actively involved and sharing of their originality and unique perspective on life and experience. The range and diversity of initial two minute responses followed by one minute add-ons is so enriching and inspirational. And that night the topics were chosen by a true master of the art, Tim Fitzgerald, who with his ever affable and easy-going presence and fine-tuned comic sense soon got everyone going and channelled the creative energy of us all with eagerness and a sense of great fun. Such a variety of themes ranging from the keeping of New Year’s resolutions, the best places to see and visit in Ireland, the granting of permission to pubs to open on a Good Friday which had many expressing positive sentiments about the move but with some reservations too, seeing a certain diminution of the sacred character of that day while one member spoke of how a Good Friday drink was had about it the sweet taste of illegality! Thoughts of springtime even in cold conditions brought a lovely contribution from Jerry Hennessy on the lengthening of daylight and the signs of bright fresh growth that heralds gentle pleasures of the garden season. Frank O’Driscoll spoke eloquently of the peaceful and absorbing enjoyment that comes of stepping back from the frenetic pace of life to savour a fascinating and illuminating newspaper article. The evening reached its highpoint with some truly outstanding speeches. Johanna Hegarty took on the challenge of reading a speech of historic but still contemporary significance, the inaugural address of President Mary McAleese given in Dublin Castle on November 11th 1997, encompassing so many strands: the deeply-held Irish love of freedom, the sense of community and mutual solidarity, the place in the hearts of those left behind of our emigrants overseas, the longing for peace on our island, the building of a pluralist and inclusive society. Listening to Johanna’s measured and powerful delivery, it was extraordinary that this speech made over twenty years ago could just as well be made today with the same topical relevance. It remains evergreen having lost nothing with the passage of time. Lauded afterwards by evaluator Mairead Barry, who thanked Johanna for her brilliant choice of subject and referred to Mary McAleese as a real woman of substance and – in a striking turn of phrase – as our Lullaby President who had made us dream of all that was best and most generous in the Irish character and where it might lead us. It is always worth remembering that no speech delivered at a Toastmasters meeting is left free-standing: every speaker receives the benefit and enhancement of a wise, insightful, positive assessment that is never fully complete without some suggestion for even greater improvement and advancement for the next time. This is a vital aspect of the beautiful art of communication which is all about the interaction between speaking and listening that makes every meeting such a most uplifting and life-expanding occasion that will send you home happy and glad for having been there. Humour is always the most difficult genre to take on but Padraig Murphy rose to the challenge superbly with a light-hearted on acquiring a new tractor. . The assignment called for exaggeration and flamboyant gesture as he recalled childhood days when he came to know the different sounds made by every make of tractor that passed outside the school, whether Massey Ferguson, New Holland or John Deere or whatever. Fast forward to a day in the 1980s when the gleaming first new tractor arrived and the initial rejoicing gave way to consternation when many hilarious and well told adventures the machine fetched up in a ditch, its wheels in the air and the mood of the moment brought to life as Padraig fell to his knees and spread out his arms in theatrical dismay. But all’s well that ends well, everyone was alright and the tractor was fine and soon made upright again to begin a long and successful working life. It was such a lovely, airy, comedy-rich speech that would make anyone cast aside their troubles and laugh uproariously, for which Padraig received the highest praise of his evaluator Kevin Walsh. Every Toastmasters meeting depends on the smooth and efficient management of time, a task that on January 30th 2018, was so expertly and precisely carried through by Timekeeper Fanahan Colbert, in control of the lights and the bells that tell speakers they have used their allotted time. This is vital for in Toastmasters, every participant has their voice and each are given their time, but the Timekeeper ensures that others get their share of time also whether as speakers, evaluators or contributors to the Topics session. The trick is to use the time that is allowed most effectively and cogently to convey your meaning and get your message across. It is a wonderful discipline that concentrates the mind and ensures that everyone is given their chance to be heard, to be appreciated and to enjoy the expansive benefits that active membership along brings to everyone willing to give it a go. The strands of the entire meeting were brought adroitly together by General Evaluator Frank O’Driscoll who expressed the shared happiness of all at what had been achieved that evening. For there is nothing so valuable as activities that make people happy and filled with gladness as we all were and as we look forward to being once again at our next meeting on this coming Shrove Tuesday, February 14th, at 8.15 in the Fermoy Youth Centre. For further information, please contact Mary Whelan at 087 7971006 or Kevin Walsh at 058 60100 or log on to our mobile-friendly website toastmastersfermoy.com or find us on Twitter @ FermoyT.